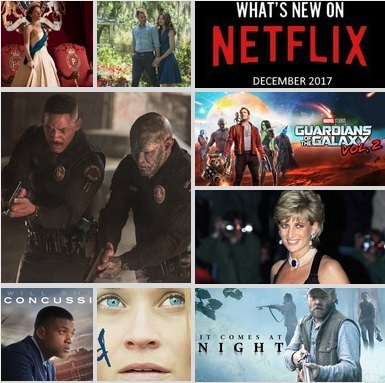 One way to enjoy the holidays with family and friends is to binge on some Netflix holiday favorites along with a few highly anticipated originals. In an alternate present-day, Daryl Ward (Will Smith), a human cop, is partnered with an orc named Nick Jakoby (Joel Edgerton) in the Los Angeles Police Department. Scott and Nick then go an adventure involving ancient relics in the Netflix original film Bright (Dec. 22). Once Smith has kept you entertained with this one, Chris Pratt takes over in Marvel’s Guardians of the Galaxy Vol. 2 (Dec. 5). You know what to expect from this sequel if you enjoyed the first. With everything royal being a hot topic these days, I’d suggest getting down and dirty with the second season of the popular Netflix original series The Crown (Dec. 8). If you’re a fan of Princess Diana, like yours truly, I’d suggest watching Diana: In Her Own Words (Dec. 1). This documentary features archival footage and personal recordings, offering candid insight into the life of the beloved princess. One horror to watch this month is It Comes at Night (Dec. 12). Joel Edgerton plays an overprotective father who protects his home from the danger outside. He is faced with the decision to help another family that comes knocking on his door. Horror fans can also sink their teeth into Sinister 2 (Dec. 1) which follows a single mother and her twin sons who move into a rural house, unaware of its history of being inhabited by an evil spirit that preys upon young children. When a child goes missing, the town goes in search for answers and many secrets come forward in this mystery titled Dark Season 1 (Dec. 1). Another mystery that should be on your radar is Erased Season 1 (Dec. 15). It follows a man who travels 18 years back in time to stop a kidnapping that took the lives of his close friends. Of course, our list is not complete without some much-needed drama. Reese Witherspoon plays a divorced woman who goes hiking alone without any prior experience in Wild (Dec. 1). If that isn’t your cup of tea, Will Smith’s Concussion (Dec. 14), based on the true story of a forensic pathologist who made a controversial link between NFL players’ concussions and brain disorders, might just be the drama you won’t want to forget. Two more heartfelt dramas that we recommend watching are Before I Fall (Dec. 1), which follows a young girl as she relives the day of her death over and over again, and The Best of Me (Dec. 4), which follows high school sweethearts who reunite years later at a funeral. Happy streaming and happy holidays! Here is a complete list of titles releasing on Netflix in December. State of play is what I’m watching. I know it’s not a series but it should be. I like The 100, Riverdale I Watch with my niece, Strange Things. Those are just a few that I can remember, The walking dead is another fav.